Scotland Women’s Under-19 midfielder Lizzie Arnot is looking forward to tonight’s clash against the Netherlands in Norway, but insists the team are prepared for a tough encounter in Jessheim. The Hibernian winger was influential in Scotland’s victory over Belgium on Tuesday in their European Championship opener, a win which puts Scotland top of Group A going into the fixture. Speaking from the team hotel in Lillestrøm, Arnot described the positive atmosphere within the Scotland camp. “The build-up to tomorrow has been good” Arnot told the Scottish FA website. The win over Belgium was Scotland’s first ever victory by a women’s team at a major finals. Whilst Tuesday was a historic day for all concerned, the left-winger was keen to stress that the match is now in the past, with all of the players’ focus on tomorrow’s match. “We take confidence from Tuesday’s victory. The win was the first for a Scottish women’s team at a major finals, which is something that we take belief and pride in. Tomorrow’s opponents provide a stern test, but not at alien one. Scotland played the Netherlands at the La Manga tournament, with Scotland securing a 2-2 draw thanks to a brace from Zoe Ness. “We played the Netherlands in La Manga and it was a very tough game. We are under no illusions; they will be a tough opponent once more tomorrow. With the tournament in full-swing, the rest time between matches shortens is only two days. For some players, the lack of recovery time may be an issue. Arnot believes that this is not an issue for her and her Scotland teammates. I’ve been absolutely loving it here it has been such an enjoyable experience, The facilities have been great, and representing Scotland at a major tournament has just been amazing. 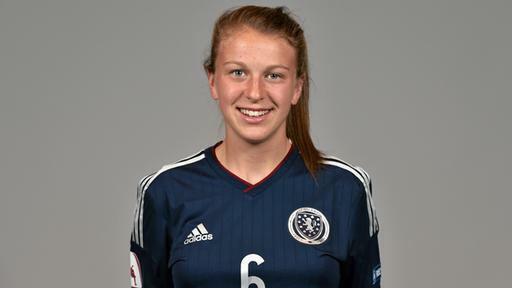 Arnot is one of five Hibernian players in the Scotland squad, along with Jenna Fife, Lucy Graham, Megan Cunningham and Katey Turner. Having so many players from club in the squad who know how each other play is beneficial, but Arnot insists that the contributes to a greater club-like dynamic within the Scotland squad. “It helps obviously that so many of us play together on a week-in, week-out basis. We’re close, but it doesn’t affect the team dynamic at all. Everyone in the team gets on with each other really well, there are no cliques within the squad. It is a journey that Arnot is obviously keen to continue with the rest of the squad. A win against the Dutch would go a very long way to securing Scotland’s place in the semi-finals. As enticing a prospect as it, it has not shifted the focus of the squad.